The strong wind woke me up at 6 am, and since there was not way I was going to manage to sleep again with that noise, I got up. I crawled out of the tent to find that the bike was on its side again, and this time when I lifted it I saw that the left side front indicator had broken. 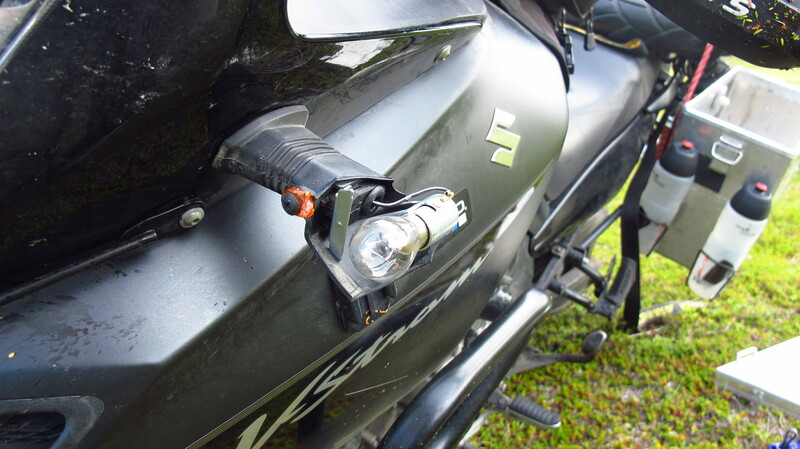 The front indicators stick out a long way on the V-Strom, they are a really poor piece of design and the first thing that breaks when you drop the bike, but I could not believe that after coming all this way and having survived falls in the Kazak desert, it had to happen here. The wind was so strong that I did not feel very comfortable leaving the bike there while I packed everything and got ready to go, so I folded the tent as fast as I could in the strong wind, strapped everything on and got the hell out of there without even having breakfast. Not that I could mind you, the stove did not work. As soon as I found a more sheltered place, I stopped and taped the pieces of indicator together. The repair seemed to hold, so I thought I would leave it like that instead of trying to find a new one which would probably cost a fortune here. I rode the 100km that I had not finished the previous day and as usually happens, saw plenty of good spots where I could have spent the night if I had gone a bit further. I was running low on petrol, so I checked on the GPS and saw that there was petrol station in Mehamn, the last town before the lighthouse. When I got there, however, the pump was not working, and the man at the petrol station told me that I could either wait until 4 or 5 in the afternoon or go to Kjøllefjord, which meant riding back 13km to the last junction and then 23km to the town. I got there with the last bar on the fuel indicator flashing, praying the petrol station there was open, as the last one was more than 100km south. It was open, and after filling up I rode up again and to Slettnes, where the lighthouse was. It was 10 am and I was in the middle of nowhere, so there was not a single soul in the lighthouse. This was my own private Nordkapp, away from tourists. The lighthouse itself was made of metal, the only one of its kind in Norway and the northernmost lighthouse in Europe. 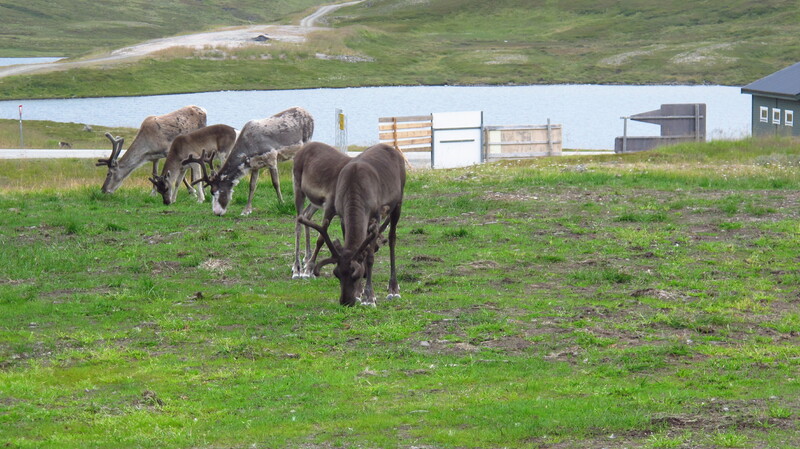 I took a walk around it and then went to the Nordkapp, which was just across the fjord. I could almost see it in the distance, but getting there by road meant a detour that would take all day. That was not a problem, as my plan was to get there just in time to find a campsite and then ride the last few kilometers to the Nordkapp after dinner, in time to see the midnight sun. On the final 100km, once I was on the road that only led to the Nordkapp I started seeing what I had not seen all morning or the previous day – lots of tourist coaches and bikers. The Nordkapp is on an island, but there was no need to take a ferry, a 6km-long tunnel cut into the rock goes under the sea to connect the island to the mainland. Riding the tunnel was quite an experience, it has a steep gradient that goes down for 3km and then starts going up again for another 3km, like a giant V. Out on the other side, I went past the main town, where the tourist cruises stop, and made my way up the mountain until I came to the Middnatsol Camping, the last one before the Nordkapp. I stopped, set up the tent and cooked dinner, seeing coaches and bikes go past on the road below. 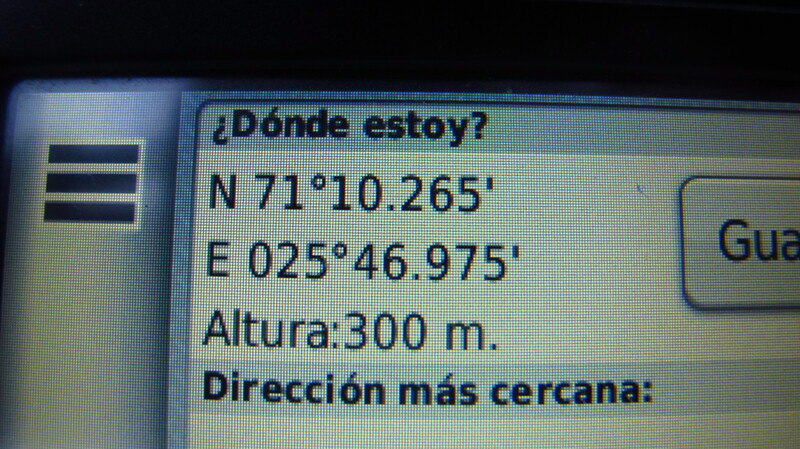 At half past ten, I got on the bike and rode up the last kilometers. It felt strange, I had been on the road for more than a month and now I was finally going to reach the point where I would turn around and start heading home. I was lucky and there was no traffic on that last bit, so I rode slowly and took my time to think about all the things that I had seen and all the people I had met on the road. It had been an intense experience, lots of emotions and kilometers condensed in a few weeks. An experience I would never forget. Then, up ahead, I saw it. 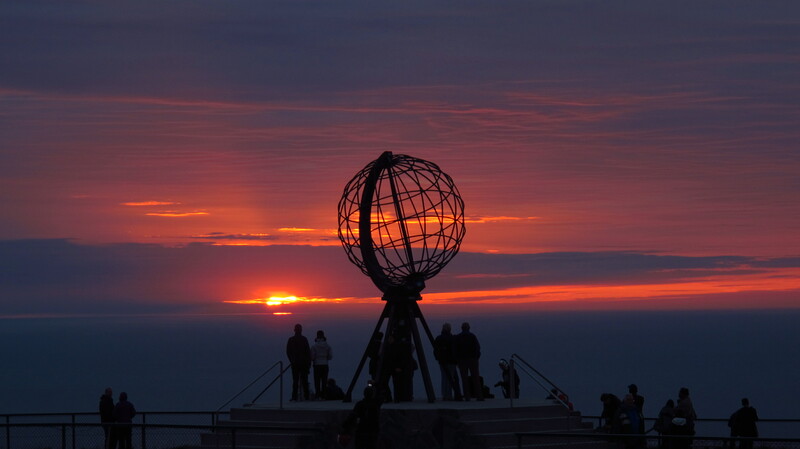 The Nordkapp. 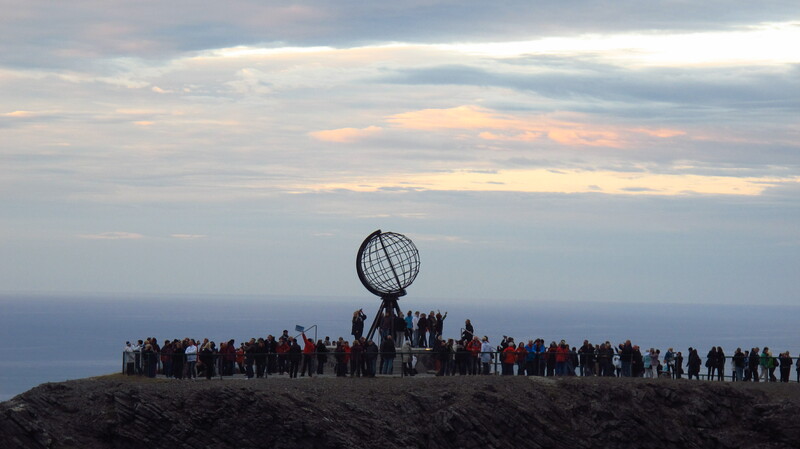 The northernmost point in Europe. I had made it here from the desert in Kazakhstan, in a bike with so many kilometers in it that most people would have sold it long ago, with a back rim that had been repaired by a mechanic in a shed in Russia, with my suit covered in dust, dirt, rain and insects from 12 different countries. 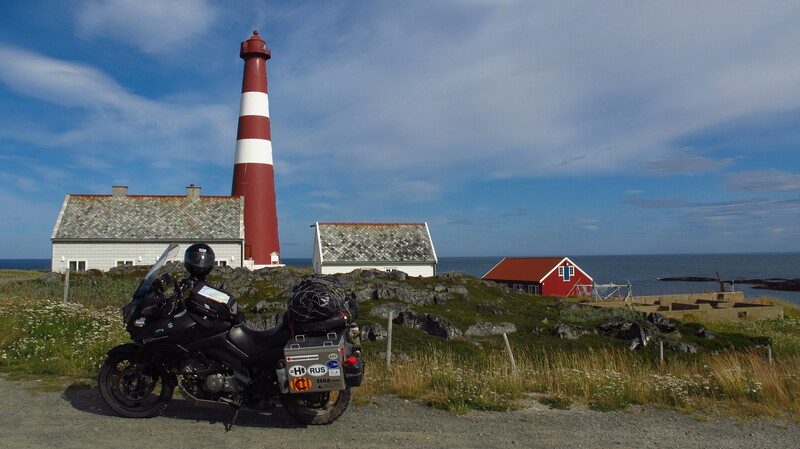 I paid the toll (yes, you have to pay to get to the Nordkapp, and it is not cheap), parked my V-Strom in a long line of GSs, took out my helmet and gloves and walked to the point where Europe finishes. It was still early, and the sun was hidden behind some low laying clouds floating over the sea, so I took a walk around the complex, visited the museum, the audiovisual show, the King’s View viewpoint and the gift shop, where I bough an overpriced sticker for the bike. At 23:30, I found a spot on the handrails that was free of tourists and waited for the sun to come out below the clouds. It was like a regular sunset, until you realized that unlike regular sunsets, the sun was not just coming down, but also moving from left to right. In fact, it was moving faster laterally than down. At midnight, it skimmed over the horizon and then it started rising again. A new day had begun and I had seen sunset and sunrise in the space of an hour. 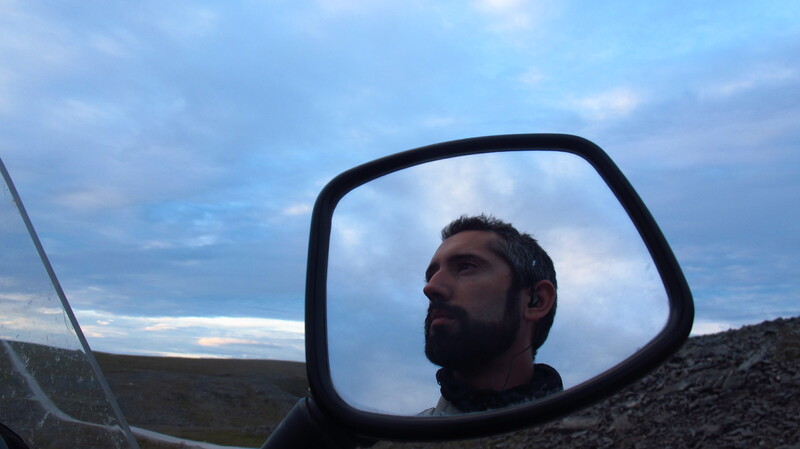 This entry was posted in Stroming The World 2013, Travel and tagged midnight sun, Nordkapp, wind by Kilian. Bookmark the permalink.